When it first hit theaters, the selling point of the film adaptation of Kevin Kwan's Crazy Rich Asians was often stated to be the fact that it has a main cast entirely made up of Asian actors, a unicorn-level rarity for a wide-release studio film. And it's very impressive that the filmmakers didn't succumb to the temptation to throw in a non-Asian best friend to give those audiences an "in". But the real reason to see Crazy Rich Asians is that it is simply an utterly entertaining film, powered by an excellent cast led by two wonderful leads in Constance Wu and Michelle Yeoh. There's a lot of heavy interpersonal drama at the core of the film--as Eleanor seeks to protect her family from invasion by a foreign entity and Rachel fights for love--but for most of the movie, this is a feel-good experience, full of shiny locations, fancy clothes and witty conversations. The cast is full of some of the funniest actors out there, including Ken Jeong and Jimmy O. Yang (Silicon Valley) as two completely over-the-top lunatics, and Awkwafina as Rachel's college roommate, whose family is rather trashy. I often find myself conflicted by Awkwafina, as she tends to be remarkably annoying, but she often manages to draw laughs. Toss in Nico Santos (Superstore) as an outsider cousin who acts as Rachel's guide to the family, and the cast is loaded with comedic talent, with Wu being quite funny herself. Though the film is light and breezy overall, when it gets serious it's just as good, thanks to the solid performances across the board, including Gemma Chan as Nick's put-upon cousin Astrid. But the film mainly rides on Yeoh and Wu's shoulders and they are more than capable of carrying the movie. Wu is effortlessly charming and able to shift from rom to com with ease, while everyone knows that Yeoh is brilliant and she's at the top of her game here. When the two are paired up, it makes for an acting master class, particularly a mahjong game they play as metaphorical combat, which is just a wonderful moment to watch in a movie that's eminently enjoyable. Even if the film wasn't full of great actors, it would still be an aesthetic treat, as the film offers up sumptuous locales to enjoy, often acting as a travelogue. Chu knows how to make a film look great, and working with DP Vanja Cernjul, he slathers this film with style, while the music and visual effects raise the energy to a constant high. The use of well-known oop standards sung in Chinese was a smart way to blend the worlds of Rachel and Nick's family subconsciously for viewers by offering something familiar that has an exotic feel to it, which represents the film as a whole: a crisp, well-made rom-com with a fresh coat of paint thanks to a lesser-utilized cultural lexicon. Warner Brothers brings Crazy Rich Asians to Blu-ray in a two-disc set (one Blu-ray, one DVD) packed in a standard-width keepcase, which is held in a slipcover that repeats the cover art. The disc features Wb's usual bland static menu with options to watch the film, select scenes, check out the bonus features and adjust the set-up. Audio options include English 5.1 DTS-HD Master Audio, 5.1 DTS-HD Master Audio English Descriptive, and French and Spanish Dolby Digital 5.1 tracks, while subtitles are available in English SDH, French and Spanish. If you thought that because this is a romantic comedy that Chu wasn't going to give your speakers work to do, you were wrong. In the DTS-HD MA 5.1 track here, frequently-present music is strong and well-distributed to the surrounds, with presence in the low-end where appropriate, but plenty of heft throughout, while atmospheric effects create an effective soundstage in the surrounds (when Nick and Rachel visit a busy outdoor market in Singapore, the mix puts you right in the middle of it.) The less aggressive audio isn't given short shrift either, as dialogue is clean and easy to understand, with solid placement and directionality where it fits, thanks to discrete channel usage. No complaints here. The big extra here is an audio commentary featuring Chu and Crazy Rich Asians author Kevin Kwan. Each obviously has their own perspective on the material, and thus they can provide different points of view, as they talk about the origins of the original book, the changes that were made in bringing it to the screen, the development of the characters and the structure of the story. Talk of editing decisions gives insight into how the film ‘s final cut came together, while Chu and Kwan explain a pair of scenes that made sense in context, but are even more meaningful when read with some back story. It's pretty much just want you want from a commentary, and illustrates why more authors should get behind the mic for their works' adaptations. 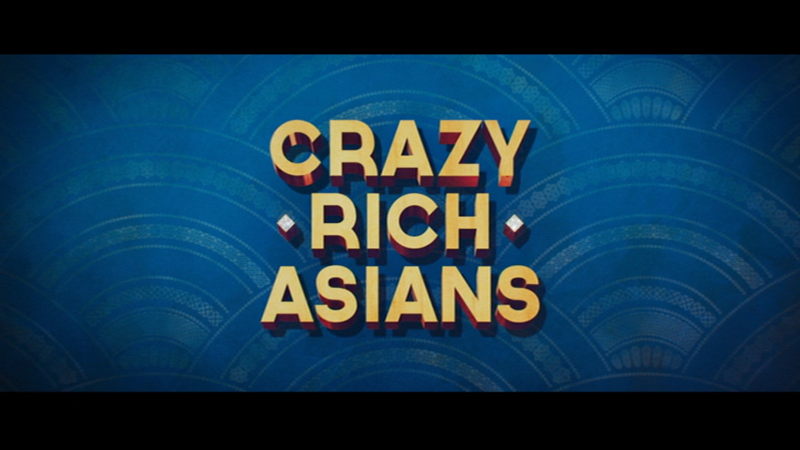 A decent behind-the-scenes promo titled "Crazy Rich Fun" (7:18) features plenty of set footage and interviews with the majority of the cast, and touches on the importance of making a film with a predominantly Asian cast, the influences on the book, the importance of the comedy in the film and the depiction of Chinese culture. It's certainly not a deep dive, but it's good to hear from those involved. There's a 12:10 reel of seven deleted scenes available to check out, though some are alternate or extended versions of moments seen in the movie. In these clips, Rachel's mom gets a bit more to do, there's more hinting at the wealth of Nick and his friends, and some odds and ends, but three stand out as worth taking a look at. 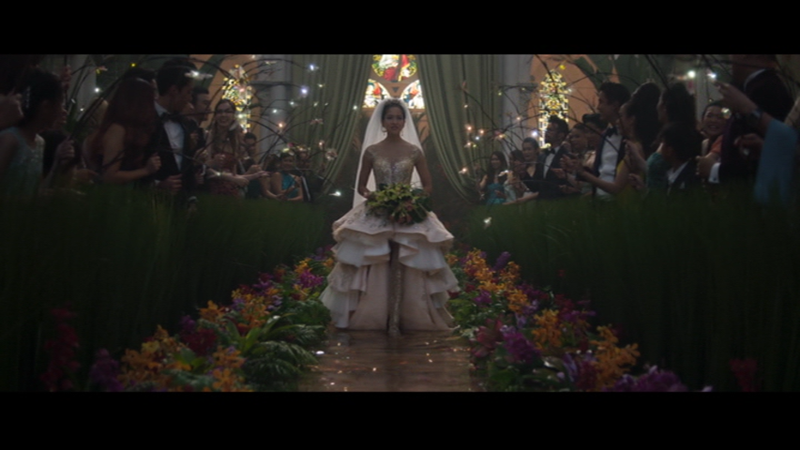 One offers a moment of dialogue that in the film is offered wordlessly, showing the effect of editing decisions, one directly explains a plot device that is more subtly covered in the movie, and another includes a dance scene that was wisely cut, giving more power to the film's mid-credit surprise for readers of Kwan's books. Wrapping up the extras is a very brief gag reel (just 1:47), naturally dominated by the more comedic members of the cast, particularly Jeong. From the first notes of the delightfully old-school opening score, Crazy Rich Asians is hugely enjoyable to watch from all angles, especially with the great performances and the delightful style and energy on display. Feel free to think of it as a somewhat more grounded My Big Fat Greek Wedding, with a lot more panache. Warner Brothers has brought the film home in beautiful shape, and has provided a decent slate of extras, highlighted by a commentary from the creator and the adapter. Though its greatest triumph overall may be its success in pushing forward Asian representation in mainstream films, it's a fun, well-made watch no matter the demographic.